Are you curious about the history of that old-looking house you drive past on the way to work? Did you ever wonder if there have been any finds of prehistoric artefacts near where you live? Would you like to explore what things of historical interest you might find along the way of the walk you are planning for the weekend? There’s a web site for that, you know. Increasingly my first stop when exploring the history of some place is the Historic Wales Web Portal. 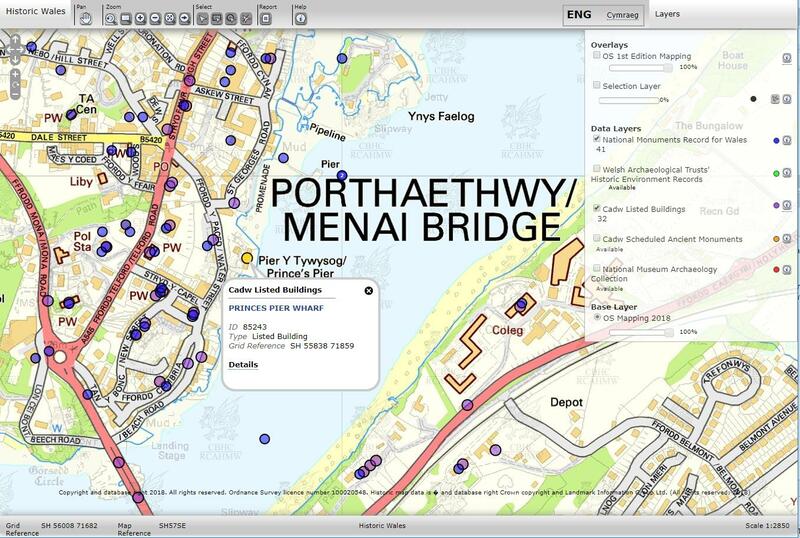 Maintained and coordinated by the Royal Commission on the Ancient and Historical Monuments of Wales (RCAHMW), in conjunction with the National Museum Wales and Cadw, this map-based database brings together the historical records of all these organizations as well as those of the various Archaeological Trusts around the country. It makes a mind-boggling amount of historic information easily accessible, and, for anyone interested in both maps and history, can lead to hours of fun and lost productivity. When you first go to the web site you are presented with a map of the whole of Wales. Once you zoom in on your area of interest the various options on the right side become available. Here you can choose which data set you wish to use, resulting in dots being placed on the map for each feature of historical interest. Clicking on these dots gives you a brief description, with a link to more information. 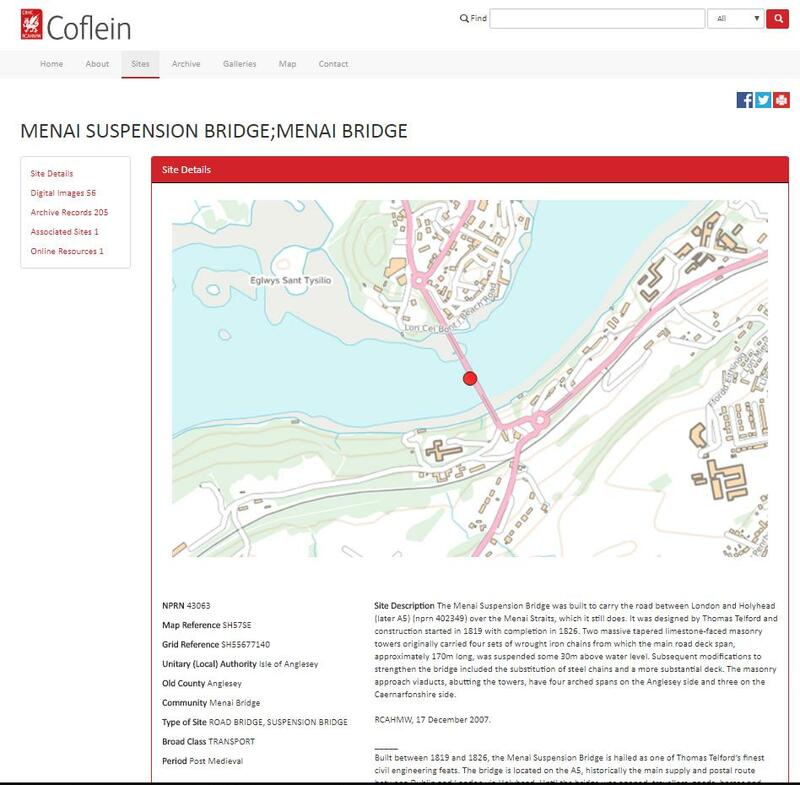 The National Monuments Record for Wales option displays all the sites recorded by the RCAHMW, with links going to their Coflein online database. This contains details of many thousands of archaeological sites, monuments, buildings and maritime sites around the country, together with millions of photographs, plans and drawings, historic maps, surveys and reports, many of which can now be viewed online. The Welsh Archaeological Trusts’ Historic Environment Records option maps the equally large databases of the four Archaeological Trusts in Wales, with links to their joint online database, Archwilio. There are two options to view sites in Cadw’s databases, the Listed Buildings and the Scheduled Ancient Monuments, with links to full details in the Cadw web site. Finally, the sites where the more than 140,000 items in the National Museum of Wales archaeology collection were found can be mapped with the National Museum Archaeology Collection option. One particularly useful option is the ability to turn on an overlay of the 1st edition Ordnance Survey map. This allows you to see what your area of interest looked like in the late 19th century. The basic background map for the site is also the Ordnance Survey map, but the very latest version. As you zoom in it switches to the larger scale maps, through the equivalents of the Landranger and Explorer maps, up to the very detailed 1:2500 map. The easy access to the OS maps alone makes this site well worth frequenting. Overall, this site is invaluable to anyone with an interest in historical places in Wales, providing easy access to a wealth of information from all the major sources. My one complaint is it is strictly designed for larger screens on desktop or laptop computers. It is just about usable on the higher resolution tablet computers, but attempts to use it on a mobile phone when I’m out and about have been frustrated by the small screen.